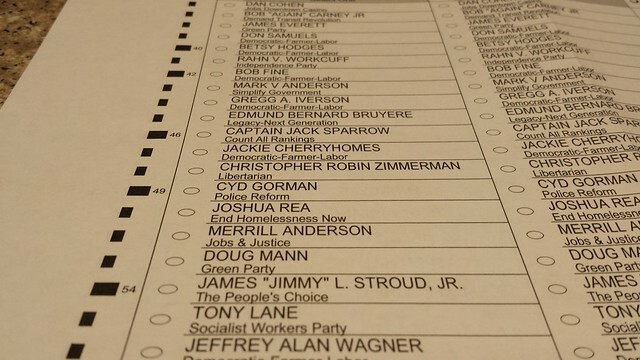 Part of a sample ballot from the 2013 Minneapolis Mayoral Election. Photo from KZiM. For bonus points, Tyler also created a PHP version! Election counting machines must earn a tough certification from the federal government. A small market combined with a significant barrier to entry results in little interest from counting machine manufacturers in producing a RCV counter. Data! RCV produces a mountain of data compared to past-the-post. All this data lends itself to analysis about voter preferences, issues of importance, and similarity of candidates (in the eyes of voters anyways). The City of Minneapolis released ballot data for download on November 15th. That data is also available in a GitHub repository of the Twin Cities R User Group. Just one day after the election, John Schrom already produced this visualization of which candidates picked up 2nd and 3rd choice votes from other candidates who were eliminated from the race. A day later, John produced this animation, and you can check out some of his data on Github. At the Twin Cities Visualization Group’s Hack Day, Christian Miller created an animated box diagram that represents votes in each round. Andy Zieffler of the University of Minnesota, and of the Citzen-Statistian blog, created an animated bar chart of the mayoral election, along with a great discussion of the RCV algorithm and events related to the election. A few days later, Andy posted a great explanation of how he created the bar chart. It’s not just civic technologists who were talking about these issues. Minnesota Public Radio wrote about RCV, including a note on the need for certification and, thanks to Winston Chang, the ease of implementing a RCV program. In a followup by MPR, Winston confirmed his ease of implementation estimate - he wrote his implementation in an hour and a half while watching TV. William Cannon implemented RCV in Python. His implementation was added to the above list. The paragraph and link on MPR’s RCV article was added. Brian Maddy implemented RCV in Clojure. His implementation was added to the above list. Christian Miller created an animated box diagram of the Mayoral election rounds. His diagram has been added to the data section above. Andy Zieffler created an animated bar graph of the Mayoral election rounds. His chart, plus his detailed how-to, have been added to the data section above. A link to MPR’s follow up on Ranked Choice Voting was added above. Links to the actual 2013 Minneapolis Mayoral ballot data were added above.